Car accidents of any type cause painful personal injuries, but most often the damage involved in passenger vehicle crashes is minor compared to the devastation of an 18 wheeler accident. Large commercial trucks dwarf all other passenger vehicles and motorcycles on the road, and the injuries caused by accidents between these groups of motorists are catastrophic. Many of these accidents are the result of driver or company negligence, and victims may be entitled to reimbursement. Distracted driving is a serious problem throughout the country, and a trucker who texts or does not give their full attention to the road can cause serious personal injury if they change lanes without looking for neighboring vehicles or fail to stop in time. Commercial drivers who operate their trucks while intoxicated can also create extremely dangerous situations for all drivers and passengers. Many collisions result in underride accidents, during which a vehicle becomes lodged beneath the truck, most often leading to fatalities and very serious injuries. Unfortunately, many trucking accidents could have been prevented. An Austin injury lawyer can conduct an investigation to gather evidence and determine what factors contributed to the collision. 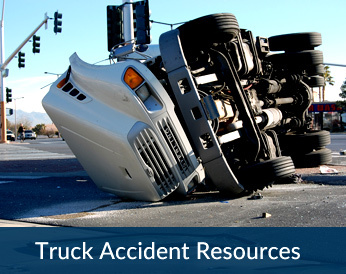 Driver carelessness or reckless operation of the truck may be to blame, and in many cases, these drivers’ records show prior incidents of the same nature. Other times, the driver has no fault in the accidents. Tragically, countless crashes that killed truck drivers or left them with broken bones or brain trauma were caused by trucking company negligence. Companies’ failure to properly maintain their vehicles and keep their equipment up to safety standards leads to terrible injury and wrongful death. It is imperative that victims contact an experienced law firm as soon as possible to investigate the scene and company records. The Loewy Law Firm is dedicated to defending the rights of the injured, and if you or a loved one has been hurt in a collision involving a semi-truck or an 18-wheeler, we encourage you to contact us for a consultation with an Austin personal injury attorney from our team. Truck accidents can be incredibly frightening, in addition to frequently causing the victims to suffer devastating and life-changing injuries, and they are often avoidable. Mr. Loewy will personally work on your case, giving you the support of a Super Lawyer and lifetime member of the Multi-Million Dollar Advocates Forum®. We can fight to help you hold the trucker accountable for your medical bills, your lost income and pain and suffering, and are ready to begin helping you. When a big rig truck hits the brakes, the trailer will sometimes maintain its speed and swing around on the hitch, posing the risk of a catastrophic collision on the road. Following vehicles may be forced into a crash as the trailer sits across the road, while a car riding alongside the truck can be caught and pinned against the truck as it swings closed. An underride accident can be a terrifying experience, and will often cause the victims to suffer devastating injuries or death. Semi-truck trailers sit high enough above the ground that a small passenger vehicle will sometimes pass underneath when the truck changes lanes without looking or hits the brakes suddenly, creating a highly dangerous situation. A tired truck driver poses a major threat to everyone on the road, and when one causes a collision the victims have a right to demand compensation. The Federal Government attempts to keep tired truckers off the road with strict Hours of Service regulations, but many break the rules in an effort to meet stiff delivery deadlines. Our firm represents the rights of accident victims following collisions with all types of trucks, from interstate 18-wheelers to local delivery trucks. If the truck driver is at fault for the accident, you have a right to claim full compensation for the injuries you have suffered. When a big truck rolls over on a road or highway, everyone is at risk of severe injuries or death-not only the truck driver. Semi-truck rollovers often occur as a result of cornering at recklessly high speeds, and are frequently attributable to truck driver negligence. Commercial truck drivers are generally held to higher standards than others in testing for blood alcohol content in drunk driving investigations, and can be held accountable for causing accidents while driving under the influence of alcohol. While many trucking accidents are caused by the trucker’s mistakes or recklessness, others can be attributed to negligence on the part of the trucking company, such as in improperly maintaining the vehicle, improperly securing cargo, or in failing to take action to discipline drivers who violate laws and safety regulations. A large percentage of all collisions involving semi-trucks and 18-wheelers are caused by truck drivers who lack the proper experience and training to avoid such accidents. If your accident was caused by an inexperienced trucker, we may be able to help you recover a settlement to cover all the costs associated with your injuries. Recovering a settlement for your injuries depends on proving that the trucker’s negligence is the cause of your accident. Common examples of trucker negligence include driving while fatigued or drunk, staying on the road in unsafe weather or driving recklessly or at unsafe speeds. Big trucks have large blind spots, and it is easy for a trucker to cause a collision by changing lanes without properly checking to see if another vehicle is in the way. If you were injured in a sideswipe or underride accident, let us fight for your right to a fair settlement.